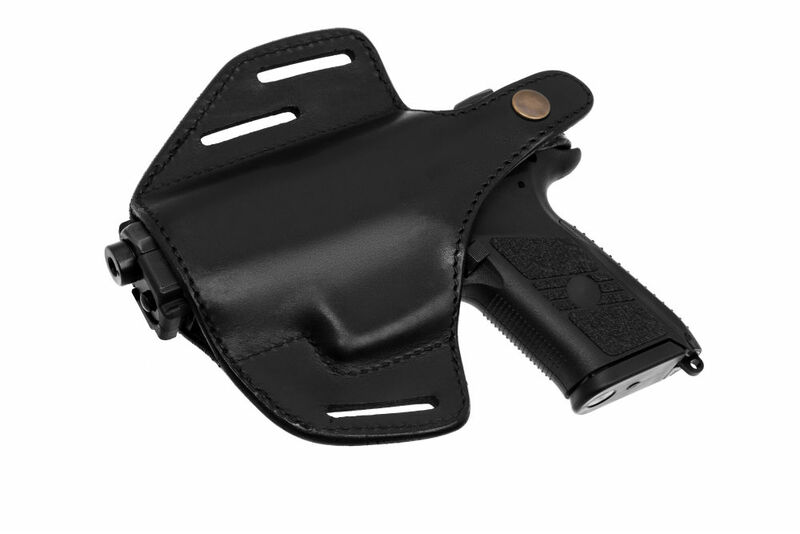 Are you shopping for a holster but you haven’t found one that meets your need? Consider making your own. This way it’ll be shaped exactly to your gun’s body and your high expectations. Does it sound too difficult? It’s not. 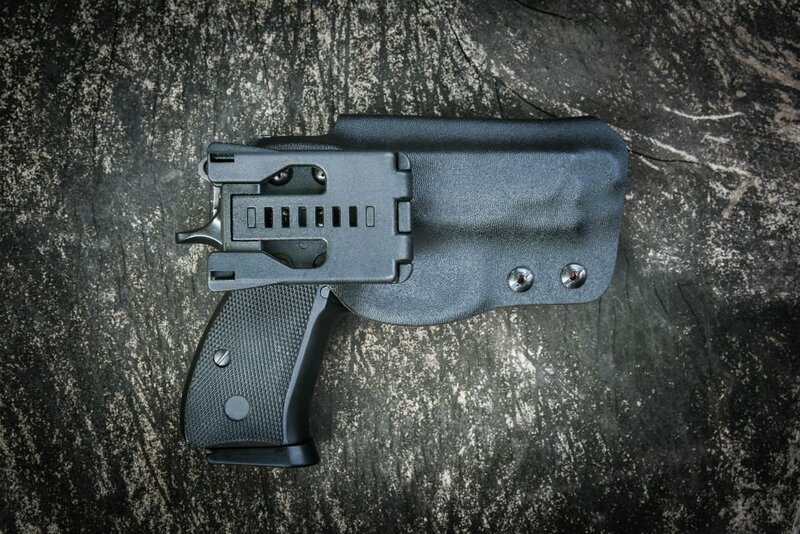 Here are easy to follow instructions on how you can make a Kydex holster at home. 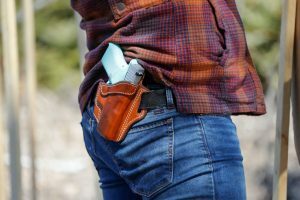 Why Make a Kydex Holster? 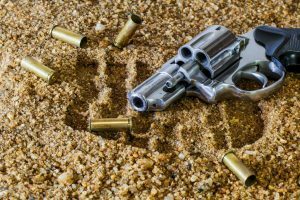 Place your gun on the piece of scrap wood, such as MDF or plywood, and trace it with a thick-barrel pen. The outline must be 1/4’’ from where the outline actually lies. Cut out the outline using a scroll saw. Stay close to the traced line, but you don’t have to have an exact cut. When you're done, the gun should fit inside the cut out without any room left. Cut out a piece of Kydex that is 20-30% bigger than what you need. You can cut it with sharp scissors or the scroll saw. If you use the latter, you need to slow the rate in which you cut. If you don’t, the cut pieces can melt together again. The Kydex starts off flat. After you form the 3D shape it’ll pull the edges in. This is why a bigger piece is needed for you to have enough room in the final product. 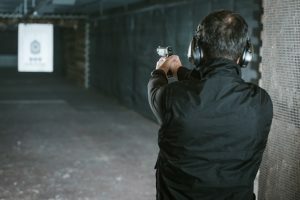 First, decide if your holster will be left or right handed. Take the cutout template and place it against your body where the holster will go. The side that’s against your body must face up. Take a piece of foam and put it on the ground and have the scrap wood nearby. Before you do this, preheat the oven to 300°C. When it’s preheated, place the cut-out Kydex inside. When it’s warm it’ll warp slightly. 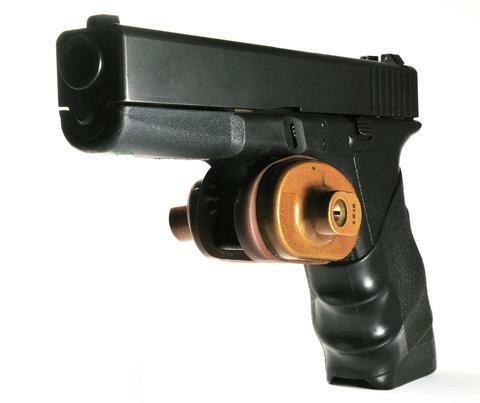 The next step is time sensitive: Wrap the Kydex around the gun’s barrel. Place it on the foam that’s on the floor. Add another layer of foam over it with the wood. You can step on the plywood for pressure. After 10-15 minutes the Kydex should mold to the shape of the gun. 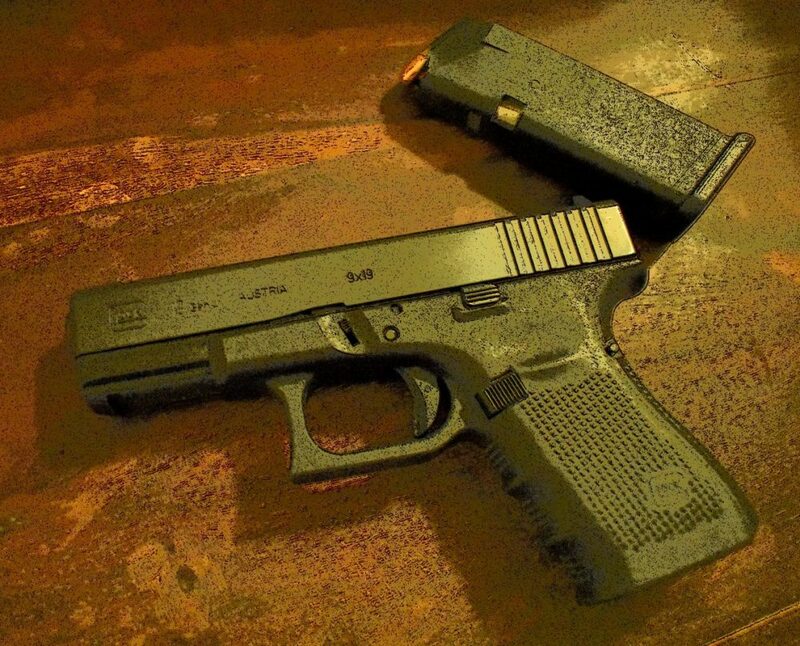 Once the Kydex is cooled you need to trim it to the shape of your gun. Take a bright-colored crayon and outline where you need to cut. Take the scroll saw and cut along the outline. Sand along the edges for a smoother finish. Drill at least two holes where the two sides of the Kydex meets. Attach the two sides with Chicago screws. If you want, you can add a belt attachment to the holster. You can buy one from any hardware store and mount it easily with screws. Your holster is now ready for use. 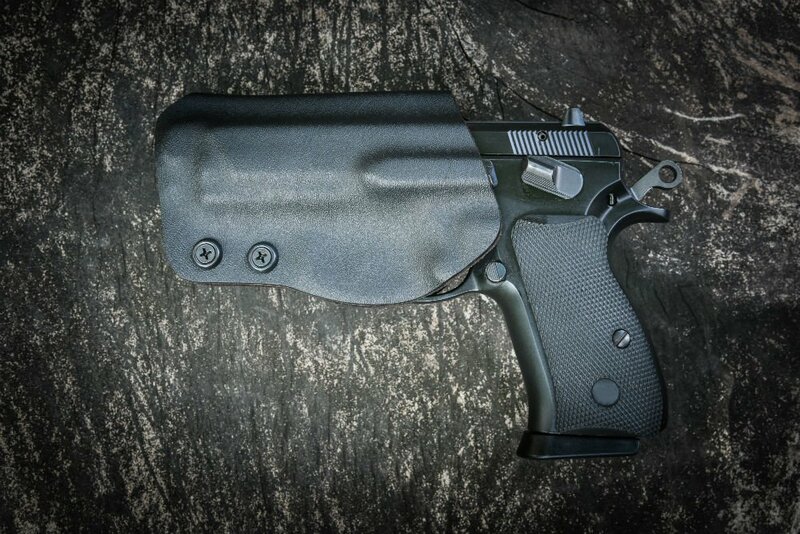 You can also make a hybrid holster using leather. The only difference is how you mold the Kydex. 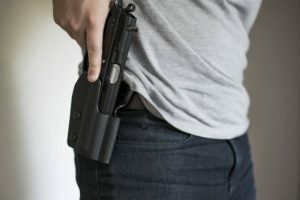 This time you lay your Kydex across the gun and not around it. Sandwich the gun and Kydex between two foam pieces and place scrap wood on top of it. Stand on the mold for 10-15 minutes or until you think it’s cooled down. Again, take a crayon and outline where you need to cut the Kydex for the holster. Once you’re done, sand any rough edges. Cut a piece of leather that’ll extend past the Kydex on all sides. Attach the leather to the Kydex by drilling holes through both materials. 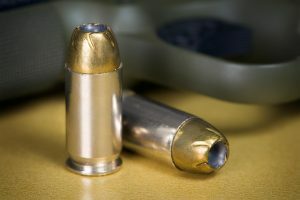 Drill the holes where you think it will help give a firm hold on the gun. When you have finished drilling the holes, remove the gun and pierce the rivets through the holes. Ensure they’re secured in place before you use your holster. When the rivets are secured, you can now trim the leather for a more polished look. You’ll notice your holster has wings; push these inwards and drill a small rectangular hole in both wings at the bend. You can loop your belt through these holes. 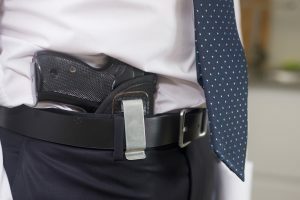 Both of these holsters are designed to be worn outside of the waistband. The only way you can conceal them is by wearing loose-fitted shirts. 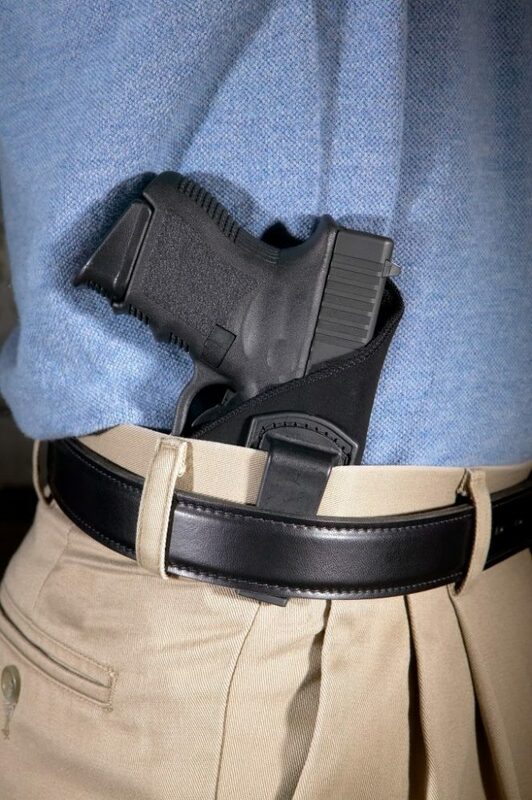 Don’t settle for anything less than the best holster for your gun. This is why making your own is a guaranteed solution for a holster where your gun fits.